Kieser physiotherapist Jedd Michell assists Maria Horan. The Kieser method is designed to help clients of all ages reduce pain and increase strength with its combination of physiotherapy and strength training. 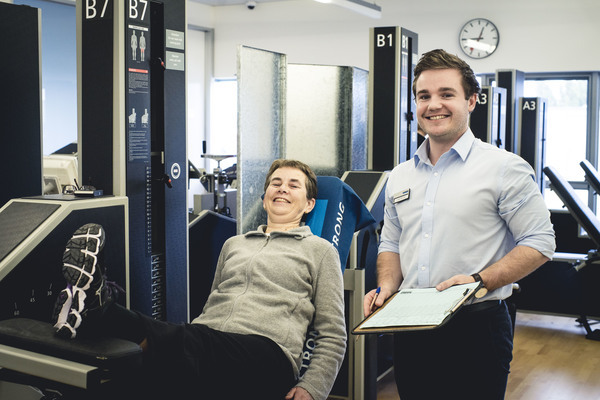 Kieser Geelong centre manager Rob Osborne says the method begins with a physiotherapist conducting an initial assessment to screen for musculoskeletal or pre-existing health conditions. “The physiotherapist then maps out an appropriate treatment plan and works with degree qualified exercise scientists or exercise physiologists to develop an evidence-based strength training program,” Rob says. After opening its first Australian centre in 2006, Kieser now operates 14 centres across Melbourne, Geelong and Sydney. The company originated in Europe over 50 years ago but has now integrated into the local community, Rob says. “We frequently work the local community, from sport clubs, to local health professionals and health insurers. Clients can undertake Kieser’s hip and knee osteoarthritis program at any of the 14 centres, including in Geelong and Torquay. “To get started, visit kieser.com.au,” Rob says.